The Citrus Products Company was founded in 1919 in Chicago, Illinois. 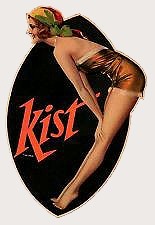 Two of their products, Kist and Chocolate Soldier* are familiar brands of The Citrus Company. 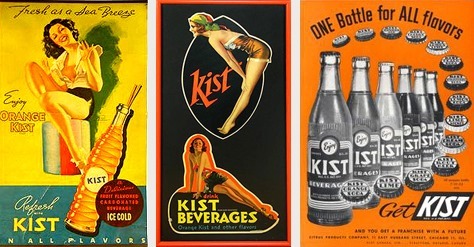 Like most soft drink companies, they experimented with different flavors to try and find their niche in the market. 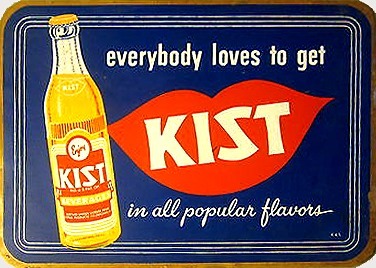 Kist was bottled in a wide range of flavors like orange, ginger ale, lemon and grape, and became very popular. They also offered a complete range of bottle sizes including seven ounce, ten ounce and twelve ounce, and also two family sizes. *There was once an unfathomable array of chocolate drinks and chocolate sodas. What happened? Today Yoo-hoo remains, but its competition has fallen on the beverage battlefield. 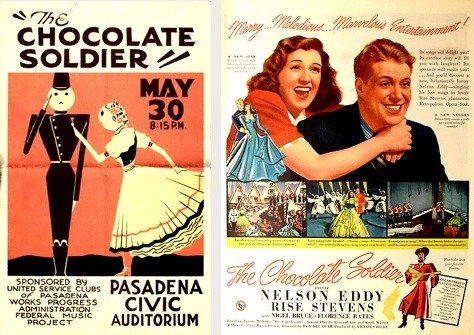 Take Chocolate Soldier, for example, which could not win the soft drink wars despite its nifty name and cute packaging. The Chocolate Soldier (German title: Der tapfere Soldat or Der Praliné-Soldat) is an operetta composed in 1908 by Oscar Straus (1870–1954) based on George Bernard Shaw’s 1894 play, Arms and the Man. The German language libretto is by Rudolf Bernauer and Leopold Jacobson. It premiered on 14 November 1908 at the Theater an der Wien. English versions were successful on Broadway and in London, beginning in 1909. The first film adaptation was in 1915. The 1941 film of the same name enlists much of Straus’s music but is otherwise unrelated, using a plot based on Ferenc Molnár’s play Testőr. Chocolate Soldier is an expression referring to a good-looking but useless warrior. The term originates as a derogatory label for a soldier who would not fight but would look good in a uniform, shortened from ‘Chocolate Cream Soldier’. It appears in that form in the 1897 book Soldier of Fortune by Richard Harding Davis. An American-style fudge (containing chocolate) was found in a letter written by Emelyn Battersby Hartridge, a student at Vassar College in Poughkeepsie, New York. 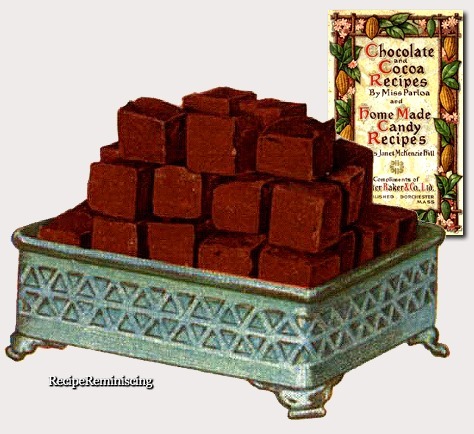 She wrote that her schoolmate’s cousin made fudge in Baltimore, Maryland, in 1889 and sold it for 40 cents a pound. 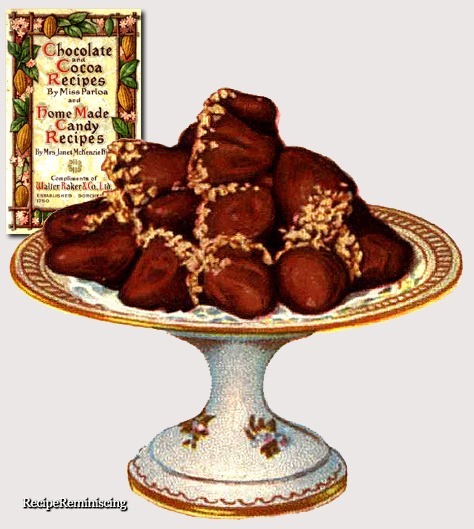 Hartridge obtained the fudge recipe and, in 1890, made 30 lb (14 kg) of fudge for the Vassar College Senior Auction.This Vassar fudge recipe became quite popular at the school for years to come. Word of this popular confectionery spread to other women’s colleges. For example, Wellesley College and Smith College have their own versions of a fudge recipe dating from the late 19th or early 20th century. Fudge-making evolved a variety of flavors and additives as it grew beyond its popularity at colleges. I posted the cook book this recipe comes from in pdf format two years ago and you can download it HERE.